Reconcile the scholars and warriors of an ancient Argonian settlement. Haj Uxith — Determine the fate of Haj Uxith's Hist tree. An ancient Argonian settlement called Haj Uxith occupies a dark corner of Coldharbour. The Argonians want to help me in my quest, but they seem to be divided over something related to their Hist tree. Complete the Trials of Body and Spirit. Destroy the Sap Collection Facility. Find the people who embody the Argonian's spiritual values. Settle the debate between the scholars and the warriors. Defeat the Champion, or bypass it using Persuade/Intimidate. While walking the southwest of Coldharbour, you may come across Treeminder Xohaneel, asking you to help her people of Haj Uxith settle a great debate between their scholars and warriors. However, she won't go into detail before you have proven your worth to each faction by completing the trials of the spirit and body. Speak to Treeminder Xohaneel to start the Trial of Spirit. When doing the Trial of Spirit, you must talk to three individuals and give them each an amulet that represents the quality they show in what they do. there are three amulets: Courage, Endurance, and Preservation. Give the Amulet of Courage to Teelawei for negotiation between the two factions and the people of Coldharbour. Give the Amulet of Endurance to Desh-Wazei for gathering food to help her people. Give the Amulet of Preservation to Ashgar for maintaining the traditions and customs of their people. After you have given away the amulets and receive a gem for each trait, run up to the top of the pyramid to find three statues: Life, Time, and the Unknown. Place the Gem of Courage on the Statue of the Unknown. Place the Gem of Endurance on the Statue of Life. Place the Gem of Preservation on the Statue of Time. Speak to An-Jeen-Sakka to start the Trial of Body. To complete the Trial of Body you must enter a trapdoor at the top of the northern pyramid before passing through several rooms containing Argonian peasants before entering the Daedric Sap Collection Facility. You then need to collect some treated wood and then add some to each of the six marked fires under the vats, which will melt the metal vats that are used to boil the Hist Tree wood. There is an alternative exit on the west side of the room, which exits outside opposite the wayshrine. Return to An-Jeen-Sakka to complete this trial. Once both trials have been complete you need to speak again to Treeminder Xohaneel, who will inform you of the details of the two factions dividing their community. The warriors lead by An-Jeen-Sakka wish to keep the Hist alive although in eternal torment by Molag Bal. The scholars led by the treeminder believe the Hist should be allowed to die ending its torment. If you side with the scholars, you will have to convince An-Jeen-Sakka to accept your decision either by defeating their champion or by intimidating him. Alternatively, if you side with the warriors, to will have to convince Treeminder Xohaneel to accept your decision either by defeating their champion or by persuading her. If you side with the scholars, you must then destroy the vampiric shard by the Hist Tree. Finally speak again to Treeminder Xohaneel/An-Jeen-Sakka to complete the quest. This quest provides one of the Light of Meridia regardless of who you side with, but if you side with the warriors, this is never made clear. 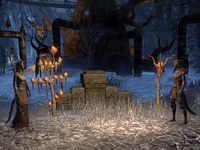 However, It should have been, because you will not have to go physically obtain a Light of Meridia, as you do in the other quests involving the light. After completing this quest, the Argonians' House in The Hollow City will unlock, and members of whichever faction you supported will be found in and around the building. I have agreed to go to Haj Uxith and find out more about the troubles plaguing the city. Treeminder Xohaneel will follow me there. When we reached the central plaza, Xohaneel was confronted by another Argonian. I should listen to their conversation. Now that Treeminder Xohaneel has finished her conversation with An-Jeen-Sakka, I should speak to her and find out what they expect of me. I can perform the Haj Uxith tests in any order I choose. I should speak to Treeminder Xohaneel to start the Trial of Spirit or An-Jeen-Sakka to start the Trial of Body. I am working to complete the Trial of Spirit. I have three amulets that each represent one of the spiritual virtues of the Argonians of Haj Uxith. I need to find the people on the south pyramid who embody these virtues. To complete the Trial of Spirit, I need to place the three gems that represent the spiritual virtues of the Argonians in the statues at the top of the pyramid that correspond with the challenges best dealt with by these virtues. I completed the Trial of Spirit. I should return to Treeminder Xohaneel and let her know about my success. I finished the Trial of Spirit. Now I should speak to An-Jeen-Sakka and start the Trial of Body. The Trial of Body requires that I enter the north pyramid and find the Dremora who collect and process the sap that comes from the Hist tree. I entered the Hist sap chamber beneath the north pyramid. Now I need to use the treated wood to overheat the vats. I completed the task that An-Jeen Sakka put before me. Now I should leave the pyramid and return to him. I overheated the Hist sap vats and completed the Trial of Body. Now I should return to An-Jeen-Sakka and let him know about my success. I completed the Trial of Body. Now I should speak to Treeminder Xohaneel and start the Trial of Spirit. Now Xohaneel and An-Jeen-Sakka want me to settle their debate. If I side with the scholars, we will end the Hist's suffering and they will join my cause. If I side with the warriors, the Hist will live and they'll fight with me against Molag Bal. I decided to side with the scholars and end the Hist tree's eternal suffering. I need to tell An-Jeen-Sakka my decision. An-Jeen-Sakka has challenged my decision to allow the Hist tree to die. To prove that my choice is the correct choice, I need to defeat the warriors' champion. I should go to the challenge grounds to face the champion. I need to defeat the warriors' champion before they will accept my decision. I convinced the warriors that my decision was the correct one. Now I can destroy the vampiric shard and end this age-old debate. Finishes quest I helped settle the debate over the fate of Haj Uxith's Hist tree. I destroyed the vampiric shard, which means the Hist will eventually die. I should talk to Xohaneel before I leave. I decided to side with the warriors and allow the Hist tree to live. I need to tell Treeminder Xohaneel my decision. Treeminder Xohaneel has challenged my decision to allow the Hist tree to live. To prove that my choice is the correct choice, I need to defeat the scholars' champion. I should go to the challenge grounds to face the champion. I must defeat the scholars' champion before they accept my decision. Finishes quest I convinced the scholars that my decision was correct and helped settle the debate over the fate of Haj Uxith's Hist tree. I should talk to An-Jeen-Sakka and let him know that the Hist will live. This page was last modified on 25 January 2019, at 09:58.